He is male, kunimitsu is his female counterpart. Did any of the male fighters in Tekken show you "that thing"? What of his features make you have any doubts as for his sexuality? The only characters that have given any signs of non-heterosexuality are Lee Chaolan and Anna Williams, yet I think both have made quite clear it is not so. It's irrelevant to the game at any rate. ok I'm just going to give a few clear pointers here, first I think in the first few tekkens Yoshimitsu's arms got shown all off and they looked very man like (corrcet me if I'm wrong),also THE VOICE. the voice is manily cybrog like, I have a good knowleadge of special effects voices (too much star wars and star trek) and I think if they wanted yoshi to be female they would have givin yoshi some kind of female cybrog voice. Anna isn't heterosexual? o_O Are you sure? 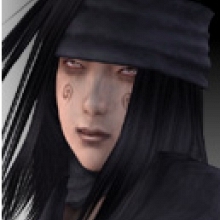 She is quite seductive and I think she "likes men"
Tenshimitsu : Anna isn't heterosexual? o_O Are you sure? She is quite seductive and I think she "likes men"
Well, I said she acts sometimes like she could be bisexual, the way she speaks etc. but I also said both Lee AND Anna have made quite clear they're not homosexual. yeah this is ture acturlly. anna's c costume is very well not the avarge lady would wear. but I don't see any of these signs for lee to be biesexual, I mean ok he dresses up that he looks like posh prick, but nothing else. Anna and Lee are bisexual in my opinion. 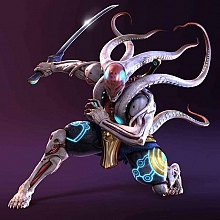 I think Yoshimitsu doesn't waste time with sexuality, because I think it's beyond him to deal with sexual pleasure. Anna, well, she seems like a universal lover, and I doubt there's anything that would stop her from liking anything with apparent beauty. Lee, well a man who's so conserned about his looks, who's so fashion sensitive, and that dresses the way he does, is obviously not your "typical" sexuality as some might call it. Heck, it's because he's not straight that he probably has all those women around him. Gay/ Bi men are girl magnets and that's a fact.